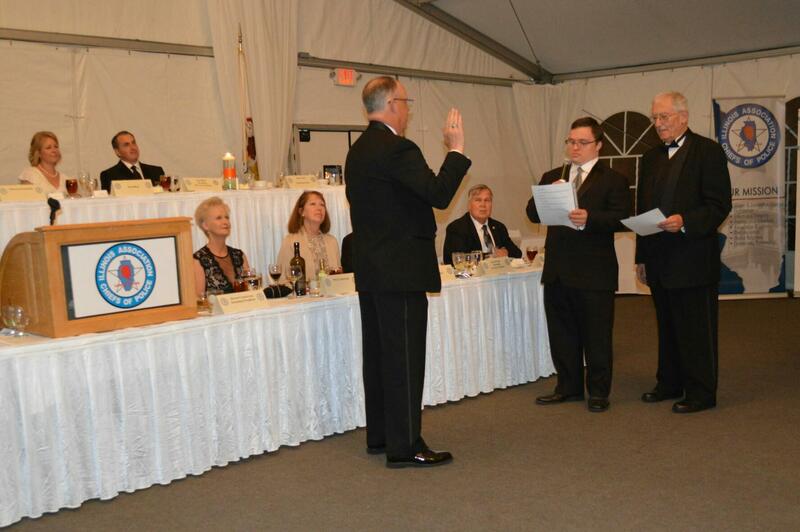 A bit of Special Olympics history was made when Buffalo Grove Police Chief Steven Casstevens was installed as Illinois Association of Chiefs of Police President on April 22. Casstevens was the first incoming president to be sworn in by a Special Olympics athlete. 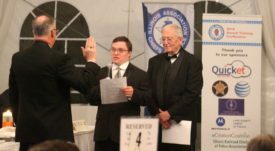 Garrett Anderson of Palatine is a longtime Special Olympics athlete with Northwest Suburban Special Recreation Association, Global Messenger and currently sits on the SOILL Board of Directors. “I had several discussions with Fox Lake Chief Russ Laine, my Parliamentarian,” recalled Casstevens. “Knowing how involved I have been with Special Olympics, he suggested having a Global Messenger do the swearing in. I loved the idea immediately and Russ suggested Garrett.” Laine also serves on the SOILL Board of Directors and knows Garrett and his family. Casstevens has been in law enforcement for 38 years – first with military police, 30 years with Hoffman Estates Police Department, 21/2 years with Cary P.D. and 3 years with Buffalo Grove P.D. During that time, Casstevens became involved with the Law Enforcement Torch Run, participating in such events as tip-a-cops, Dunkin’ Donuts Cop on a Rooftop, Plane Pull, Spare Change for Real Change and the Truck Convoy. Locally, he’s coordinated numerous fundraisers include bowling tournaments, live and silent auctions, and he’s planning a Trivia Night this year. Casstevens will serve as ILACP president for 2016-2017 term. Congratulations to Chief Casstevens on this prestigious honor!